What things the Kenyans will remember RAILA ODINGA for, to their graves. Vote wisely. - Bana Kenya News, Real African Network Tubanane. Home featured World What things the Kenyans will remember RAILA ODINGA for, to their graves. Vote wisely. What things the Kenyans will remember RAILA ODINGA for, to their graves. Vote wisely. Raila Odinga has been the Key person in Kenya and Africa for fighting democracy. It is only through his deeds we have a massive change in the country and in the governments. The below points outlines what the ODM leader has done in Kenya and Africa in General. Raila Odinga was the first person to start a fight against Single partyism. Kenya was in a single party state (KANU) during former president reign. Through Raila Odinga and his colleague James Orengo, Kenya got into a multi-part state in 1992. That is what until today we have ODM, Wiper, Jubilee and ANC from the sweat of Raila Odinga. Raila Odinga assisted former president Mwai Kibaki in 2002 to end the KANU regime in Kenya. This is when Uhuru Kenyatta was endorsed by the former president Moi to be a flagbearer of KANU. The former president Moi wanted KANU to rule the country forever but it failed due to the sweat of Raila Odinga. Raila Odinga endorsed former president Mwai Kibaki and fought until Kibaki became the president of Kenya. He was the first whistle blow on the Drugs saga which was funded by the former president Kibaki Family. The Artur Brothers and peter and Paul who came to terrorise the country with drug activities and later were deported to Armenia. He also blew the Anglo-leasing scandal with the current Deputy president William Ruto. The Kibaki government also started the Goldenberg graft that involved Brother Kamlesh Patni which made him handed over the Grand regency to the Government current known as Laico Regency in the reign of the Finance Minister David Mwiraria. His Spirit of serving Kenyans did not end there, he tried to vie for president and the Former president Mwai Kibaki rigged the elections and he went back to the office. After the Post- Election Violence, they formed a coalition government that gave birth to LAPPSET, Thika Supper highway, the today's Standard Gauge railway, Free education, and investors started flowing to the country. The former Prime Minister also with the former president Mwai Kibaki went to the ground asking people to change the constitution and it happened. Raila Odinga and Mwai Kibaki fought for the new constitution which today people celebrate for having Counties and resources flowing to the Grassroots. The current president, Uhuru Kenyatta was against the constitution because he wanted everything to be supervised and managed by the National Government as what was in KANU. When Uhuru Kenyatta won the presidential race, Raila Odinga went back to the opposition as a leader. They were with the ODM-K now Wiper leader Kalonzo Musyoka as the opposition leaders. Raila Odinga became the key player of Mining graft in the TNA, URP government. He became a whistleblower of the NYS and SGR corruption which made Anne Waiguru and Eng. Michael Kamau resigned for court process to take its course. Raila Odinga also spoke out the Government deals to the citizens where he blew the Karen and Lang'ata land grub which was associated with the Deputy president, Eurobond which is now used for jubilee campaigns, Chicken-gate, NHIF (Tassia scandal), Afya House, Youth Fund, Dubai Loan graft etc. From the sweat of the opposition, the country knew there was a massive loot in the government. Through Raila Odinga, the president then did not even know what do to evade the Corruption sagas in his government(Sasa Munataka nifanye nini Jameni). Without the ODM leader, Anne Waiguru, Michael Kamau, Kazungu Kambi, Charity Ngilu and others would be still in office syphoning and looting the Government. Because of him, the deputy president scandals have reduced otherwise the country would have been milked to dry. Others would not have been talking of Unga being Ksh 150, it would be somewhere around Ksh 200 to Ksh 300. More companies would have closed down and more people rendered jobless. The inflation would be approximately 20 percent. The same former prime Minister opened eyes to many Kenyans about the Government loans which make the people life more difficult. He also pinpointed the lies that the Jubilee government uses to fool Kenyans through portals. He was listed among the top influential people in Africa. He is also among the people in the world with influence in democracy. He visited several countries to boost their democracy. The countries include; Tanzania, Zimbabwe, Ghana, Nigeria, Ivory Coast, South Africa e.t.c. The ODM leader will be remembered for many activities in Kenya including leading the largest political party in East Africa. Kenyans must understand that the current government did not understand the new constitution and that why they do not understand the dynamics and the layout process of making the counties work efficiently. President Uhuru Kenyatta has been struggling for something that he did not want in the first place. These are some of the reasons why life in Kenya has become difficult because the leaders did not understand the economic layout in the new constitution. 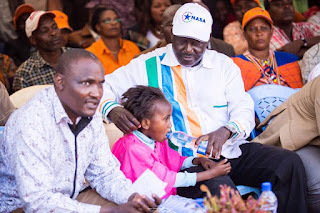 Raila Odinga has been a key role in Making the country back to its course but people have rejected through voices of the greedy people who are now making the cost of living high for normal Kenyan. Kenyans should wake up and realise that tribalism, protecting big people in their communities will make their life more miserable. When Kibaki was with Raila Odinga life was a bit cheap compared to the current trend. Now it is upon Kenyan communities to realise that tribalism will make the country more difficult to stay as more companies will close down, more Kenyans will be jobless, Cost of living will roar and Kenya debts will shoot.